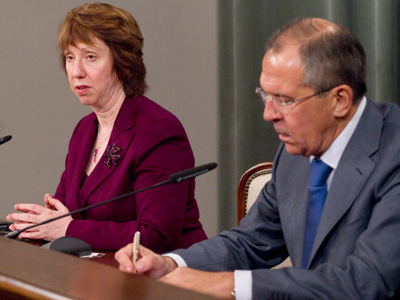 Russian Foreign Minister Sergey Lavrov met with EU High Representative for Foreign and Security Policy Catherine Ashton on Thursday in Moscow, where the serious problems concerning Iran and Syria topped the agenda. Speaking on the situation in Iran, which is coming under heavy international pressure over its alleged efforts to develop nuclear weapons under the cover of a civilian nuclear energy program, Lavrov said the six international mediators on Iran's nuclear program are expected to submit a resolution in the near future. "Representatives of the ‘six’ at the International Atomic Energy Agency (IAEA) Board of Governors have coordinated a resolution during the board's current meeting. We expect it to be passed tomorrow," Lavrov told reporters after his meeting with Ashton at a ministerial meeting of the Russia-EU Cooperation Council. The Russian Foreign Minister stressed that the resolution was “balanced” and based on “verified facts” as opposed to “speculative assessments,” which calls on both Iran and the IAEA to intensify their cooperation. At the same time, Lavrov reiterated the Russian position that the use of force against Iran was unacceptable. "We are convinced that the only way to solve all the issues concerning the Iranian nuclear program is through dialogue and negotiations," he said. Lavrov then slammed the media over its attempts to “fuel fears” over Iran’s intentions and capabilities. Lavrov said the moment is now favorable for intensifying negotiations, noting that Tehran had invited IAEA representatives. Russia would welcome any such contacts, the Russian foreign minister concluded. The Russian and EU ministers also discussed the deteriorating situation in Syria, where thousands have been killed as pro-government forces attempt to contain oppositionist movements. According to Lavrov, however, “outside players” are helping to fuel the violence. "We see the haste with which outside players are attempting to escalate confrontation in Syria, probably because they want to dramatize the situation in the media and thus receive additional arguments in order to justify some interference in Syrian affairs," Lavrov said. They continue to deny this but "we have the feeling that such plans do exist," he said. Lavrov, warning that a civil war in Syria is becoming more likely, said the Syrian oppositionists are receiving increasingly more weapons from various groups in the Middle East. “It's an open secret that groups of armed people with agendas very different from those of reforms and democracy are beginning to play a greater role in those events alongside with the peaceful demonstrators, whose aspirations and demands we understand and support," Lavrov said. 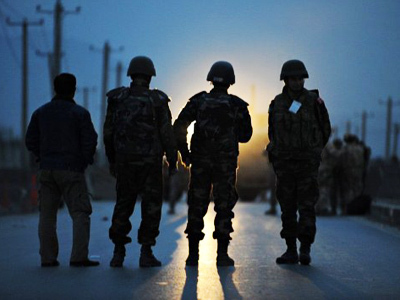 "The arms arrive via clandestine channels from Lebanon, Iraq and Jordan." 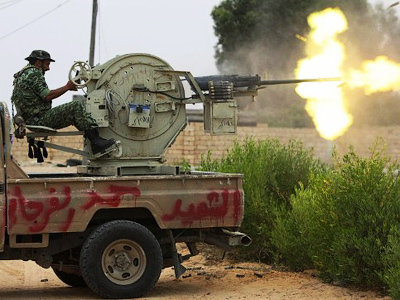 If the Syrian opposition continues pursuing such methods, they will bring about a full-scale civil war, he warned. 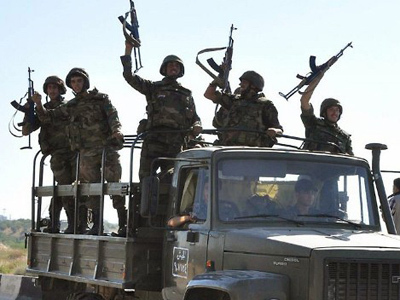 Lavrov then mentioned an attack carried out on Thursday by the so-called Free Syrian Army, a group of army defectors who want to bring down the government of President Bashar al-Assad. The militants fired machine guns and rockets at an Air Force Intelligence base on the outskirts of Damascus – a worrisome event that could escalate the crisis into a full-scale armed conflict. 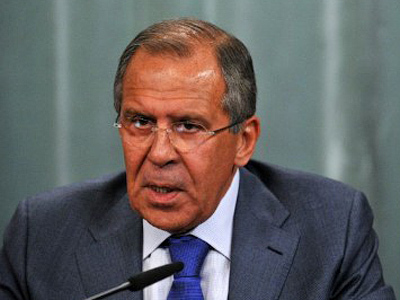 Lavrov stressed that such violent actions must be condemned, while calling on the Arab League to oversee the process. "Violent actions in Syria should be renounced by all the parties to the conflict," Lavrov said in conclusion. "Representatives of all the sides should get together at the headquarters of the Arab League in Cairo for settling the situation." At a meeting in the Moroccan capital, Rabat, on Wednesday, the League's said Syria must allow in a team of international monitors or face sanctions. Meanwhile, Catherine Ashton, lamenting the loss of some 3,500 lives since the violence began, said she believes that Syrian President Bashar al-Assad should step down. "It's time for Assad to go," Ashton told a press conference after her meeting with Russian Foreign Minister Sergey Lavrov in Moscow. EU High Representative for Foreign and Security Policy also urged the international community to maintain pressure on the Syrian government as a means for halting the violence in the Arab republic.